Okay, okay, to be fair let’s say they want to make a point to show people we are having really extreme temperatures never seen before, and although I think it’s more likely they’re clueless on how properly manage the palette of colors in their software, let this takes us to the second wave of news I’d like to discuss; How statistically unusual was [in the US] the heat wave in 2012? Check the oh-my-gaw eleven straight 95F+ in 2012, crazy uh? Nothing even close since 1872. But hold a second, why 95F+ and not 96F+ or 90F+? Let’s have a look at this comparison table between the 2012 stretch and the 1930 stretch. Well, how interesting, the lowest temperature in the 2012 stretch is, precisely, 95F. Why the Gang did not choose 96F? Because that would have split the 2012 oh-my-gaw stretch in two and they end up with nothing to sell. Why they did not choose 90F? Because then 1930 would be just as impressive and, again, nothing to sell. (oh, by the way, the red color in 2012 bar; nice touch). But let’s cherry pick just like the Gang does, how about if we consider stretches just as arbitrary as theirs? Let’s see, yeah, stretches with 101F+. Now 1930 has a three days stretch whereas 2012 only two. So what does all this mean? That if you keep looking at clouds you end up finding what you’re looking for. Consecutive 100° Highs: 4 (Statistical Probability of such an Occurrence during the June 28-July 8 period: 0.00000734%)[In my opinion], any person possessing reasonable knowledge of meteorology, climatology, and/or statistics could only reject the hypothesis that the recent heat wave was not an extreme event. (Don Sutherland, on AmericanWx.com). When extreme numbers pop up in our calculations we probably want to check them twice, specially if we are going to parade our statistical muscles in front of everybody. This 0.00000734% means that, if we were not affected by man made global warming, we should wait on average for 13,623,978 years before we see these consecutive 100º highs again! BUT we just saw those consecutive 100º in 1930! Just 82 years before! Not millions! And no CO2 to blame for! So what exactly those calculations compel and demonstrate? Well, ask the Gang. But in any case these numbers are based, again, in calculating how special is the cherry they picked. And that is all in the article, except for a link in the “related post” area to NOAA scientist: 80 percent chance recent heat records due to climate change. Which is a bit of a party pooper for the point of the Gang’s article since it means 20% chance this heat wave is nothing special. In summary, those extreme numbers cannot possibly be linked to global warming except for the NOAA scientist with his 80%. The rest of calculations are an exercise of self indulgence, and this is so because in 1930 there were very similar heat records and no CO2 to blame for as we can see nicely explained in an article from Anthony Watts that the Gang describes this time as an “attempt to downplay the heat”. The probability to encounter this particular outcome is (1/2)^10 = 0.000976, yet, would we describe this event as “extreme”? Should we feel like if something really special happened in our lives? Not really since any other outcome is just as “special”. Then comes the cherry picking, let’s imagine we keep having our walk and keep checking hundreds of men and women until we see an outcome of ten men: 1 1 1 1 1 1 1 1 1 1. Would anyone say this is something extraordinary? But this is exactly what we see in the attempts shown in the Gang’s article to determine how rare that heat wave was; they calculate probabilities for individual events that they cherry pick in a pool of data to then associate that number, somehow, to global warming. In the article there was no explanation on how the NOAA scientist calculated the 80% chances that this heat wave was due to climate change, but I guess that they mean that this kind of extreme events will happen 80% of times more often that they would if humans would not emit CO2. 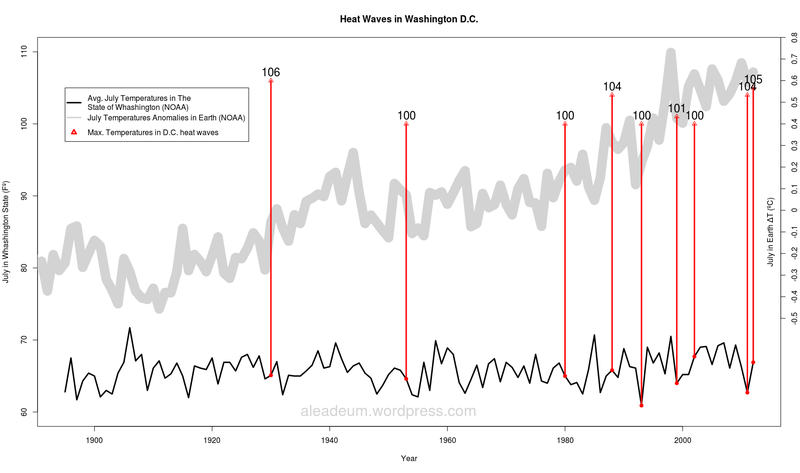 So though there is nothing spectacular in the year 2012 that we haven’t seen before, what we can actually observe is an increase in the frequency of these heat waves over the years. In other words, for every heat wave without global warming we have nearly 4 heat waves with global warming. Therefore, we could say that there is a nearly 80% percent chance that the 2012 heat wave was due to global warming with the assumptions taken for the test. As we can see, it’s a reasonable result and just exactly what scientist from NOAA’s calculated (though I don’t know if they also used this test and assumptions). But wait a minute! the p-value for the test is 0.06226, which is low but not low enough to completely discard the possibility that this result was due to chance alone (the odds ratio being one). Besides, if we also consider the fact that the temperatures in the USA were cherry picked from all over the world, the adjusted p-value would be significantly higher than 0.06226 and, therefore, within these assumptions we have no data to convincingly reject the hypothesis that these heat waves distributions are due to chance alone. The moral of the story is that if climatologists keep screaming “The Wolf is Coming!” at every opportunity they have, nobody is going to believe them when it actually comes; you can damage your reputation so much.